Middle Georgia State and the University of Northampton, based in Northamptonshire, England, will exchange faculty and students and collaborate on research as part of an agreement established by leaders of both institutions. 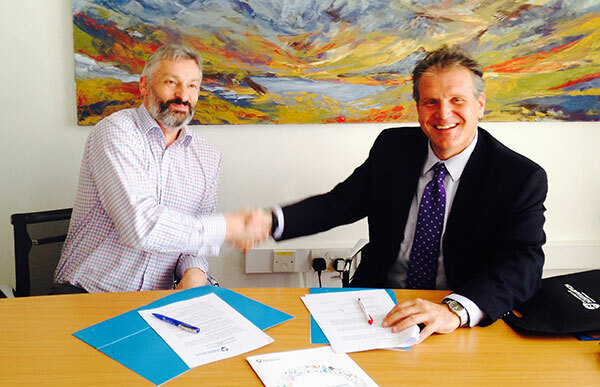 Dr. Christopher Blake, president of Middle Georgia State, and Professor Nick Petford, vice chancellor of the University of Northampton, signed a memorandum of understanding on April 23 that will allow the two institutions to work together on various academic activities of mutual interest. The agreement takes effect July 1, the same day Middle Georgia State becomes a university. "As higher education institutions with complementary missions, Middle Georgia State and the University of Northampton share interests and objectives in student exchange and joint program development," said Blake, who signed the agreement while traveling in his native England. "Both institutions are interested in establishing academic cooperation with similar universities in ways that students and faculty can benefit." According to the UK's The Complete University Guide, the University of Northampton was founded in 1975 as the Nene College of Higher Education. It gained university status in 2005 and became the University of Northampton. About 13,000 students are enrolled there. The school is ranked in the top 50 of the Guardian University Guide. Enrolling more than 7,000 students, Middle Georgia State has five campuses - Macon, Cochran, Dublin, Eastman and Warner Robins - and many online programs. It offers 19 bachelor's degrees, along with some associate’s degrees. Middle Georgia State is the home of the state's only public School of Aviation. This fall, pending approval by the Southern Association of Colleges and Schools Commission on Colleges, Middle Georgia State will launch its first graduate degree: the fully online master of science in information technology with concentrations in information security/digital forensics and health informatics.